On the eight-year anniversary of his electrifying major league debut, Strasburg had a very rough evening. Eight years ago Friday, Stephen Strasburg made his first major-league start, striking out 14 Pirates batters in an electrifying seven-inning debut. On Friday, the Nationals righty took that same National Park mound, this time facing the Giants, but the anniversary celebration turned sour in a hurry. Stephen Strasburg did not look right Friday night. The Giants hit his normally untouchable fastballs all over the park. He fidgeted with his shoulder. He landed funny. After he allowed three runs on five hits in two innings, Strasburg marched down the tunnel to the clubhouse and trainer Paul Lessard followed. Whatever Strasburg told him, the Nationals decided he could not continue. The right-hander’s night ended there. Shawn Kelley relieved him. Strasburg’s velocity was fine — high-90s, touched 98. His curveball and change-up both looked normal. At one point, he threw a fastball high and wide and a ball 55-feet in succession. He surrendered several line drives after that, unable to locate with any precision. You never like to see a pitcher leave a game abruptly, but it’s particularly alarming in this case given Strasburg’s history. The 29-year-old has made more than 30 starts just once in his nine-year career and at one point missed a full season to Tommy John surgery. His disabled list stints have often before begun with the same kind of bad start he had Friday, in which his stuff seems less sharp than usual and he looks uncomfortable on the mound. Strasburg hadn’t been enjoying his best season entering Friday, but with a 3.12 ERA and 3.44 FIP he was getting along just fine. Now, once again, his success has been interrupted by some type of physical issue. 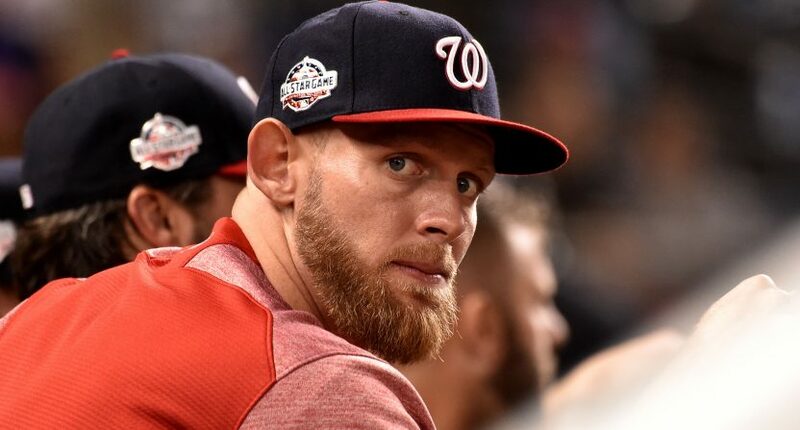 A serious injury to Strasburg would be yet another blow to a Nationals team that has suffered its fair share, with Anthony Rendon, Daniel Murpy, Ryan Zimmerman, Adam Eaton, Ryan Madson and others all hitting the disabled list this season. Washington entered Friday in a virtual tie with Atlanta for first place in the NL East, but the more Nats who miss time, the greater chance another team steals the division. Plus, Strasburg going down represents a blow to the broader baseball world, which had already endured bad news for Shohei Ohtani on Friday. Here’s hoping Strasburg gets back on the mound quickly and resumes fanning hitters just the way he did eight years ago. UPDATE: Stephen Strasburg had an MRI which revealed shoulder inflammation. He’ll go on the disabled list and there’s no timetable for his return.